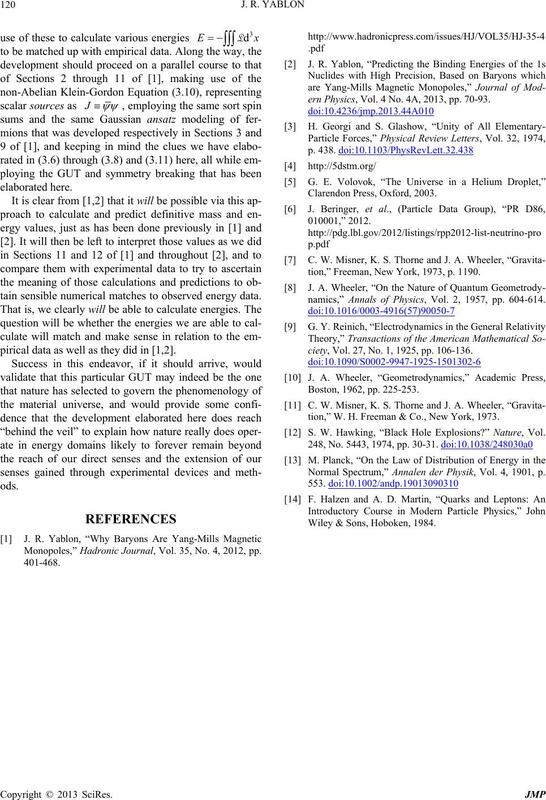 see if additional empirical confirmations can be achieved, especially for the proton and neutron and the fermion masses. ECM effect (see , pp. 62 and 66). also be in very tight accord with the observed data. denced by all of predictions 3) through 7) above. groups that may or may not appear in the natural world. 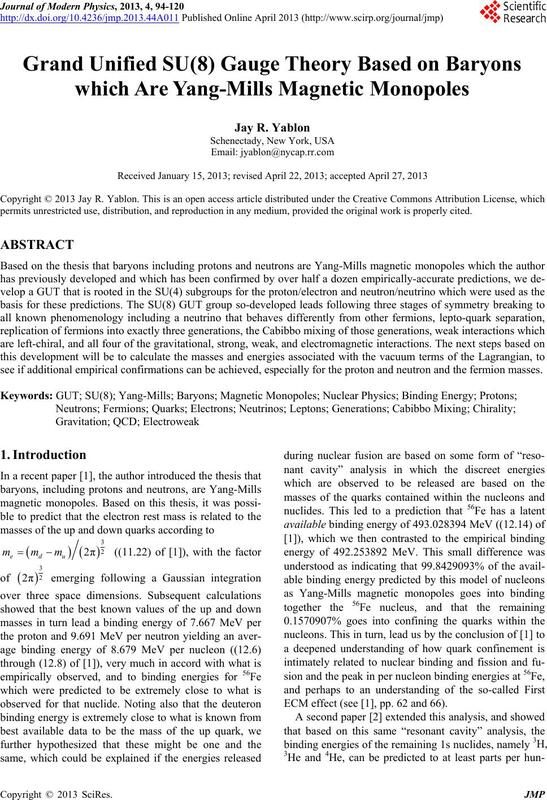 ity of SU(4)P and SU(4)N.
Mills extension, has nothing to say about fermions. 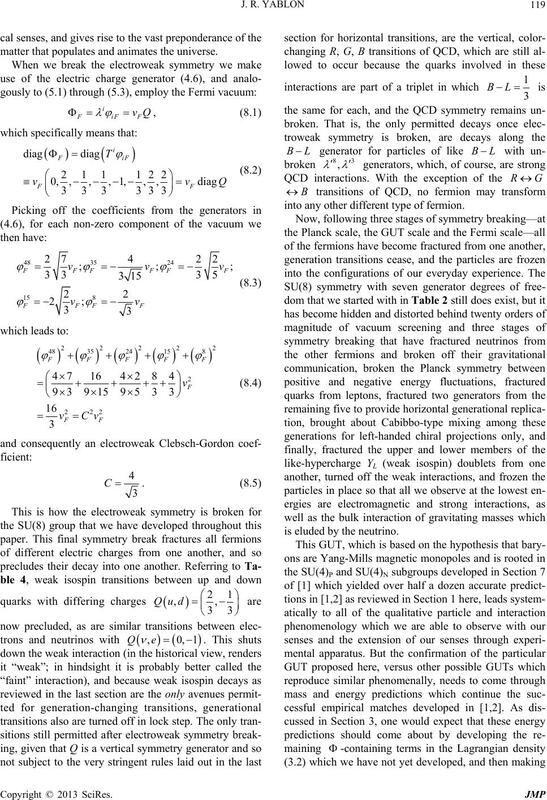 “unified field theory” without the GUT qualifier. 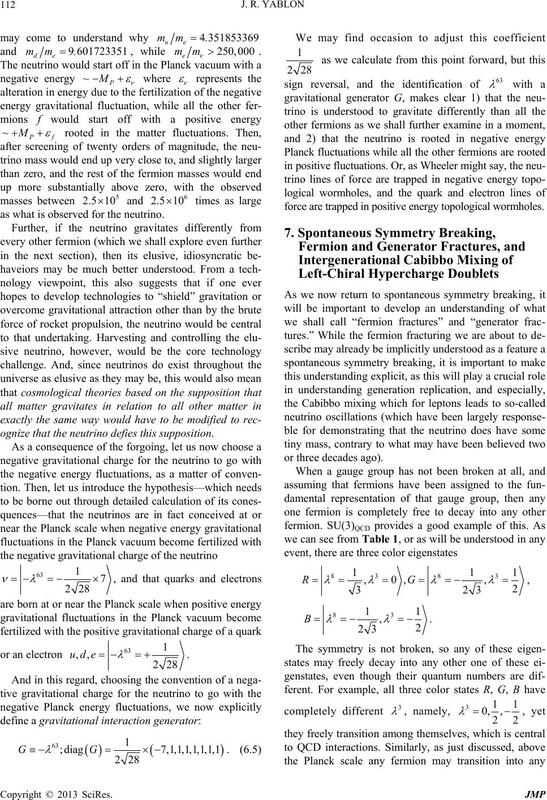 proton and neutron and the fermion masses. break its symmetry. Why do we say this? coefficients. 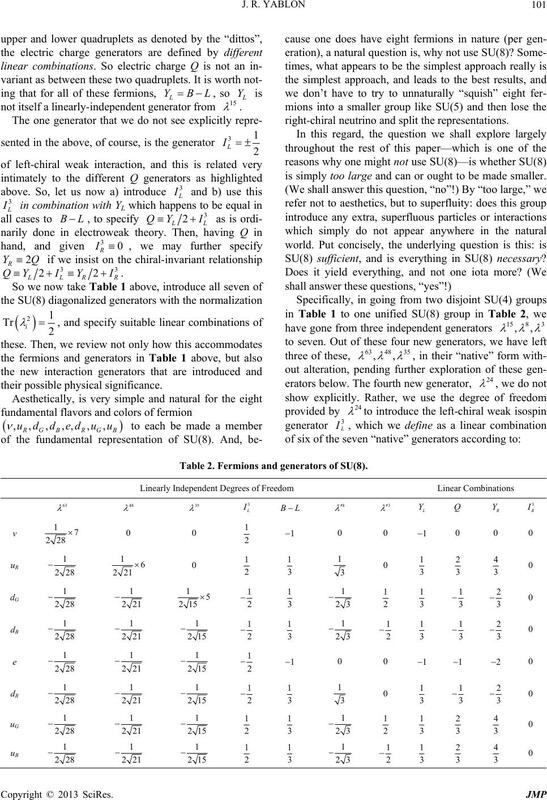 And where do such coefficients come from?
?) rather than either of these masses individually. terms in (3.2) which include the vacua . 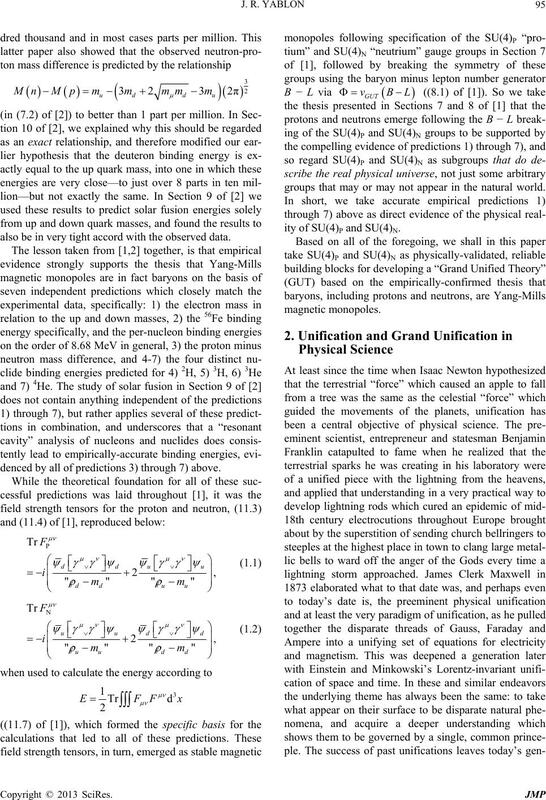 binding data, they are Yang-Mills magnetic monopoles. what we shall do here. eduu occupies the last four members. so let’s now turn to those. 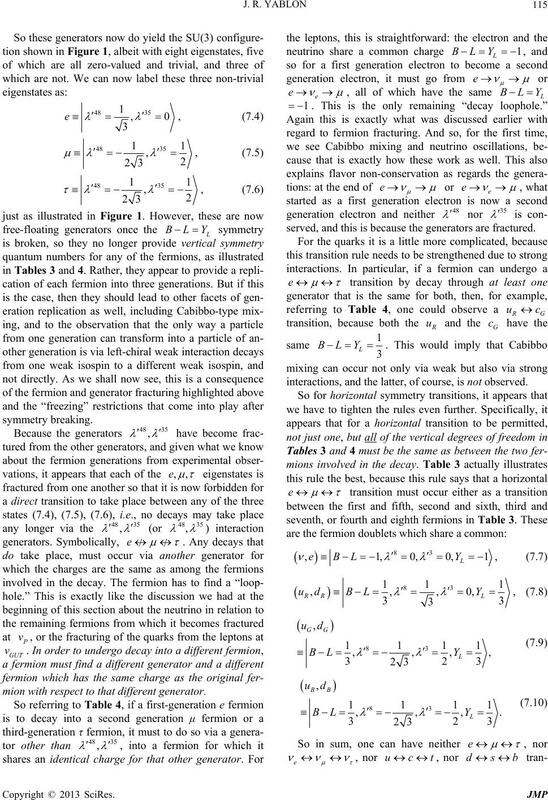 the fermions in the group. information more compactly in an easier-to-follow form. there are three linearly-independent degrees of freedom. Table 1. 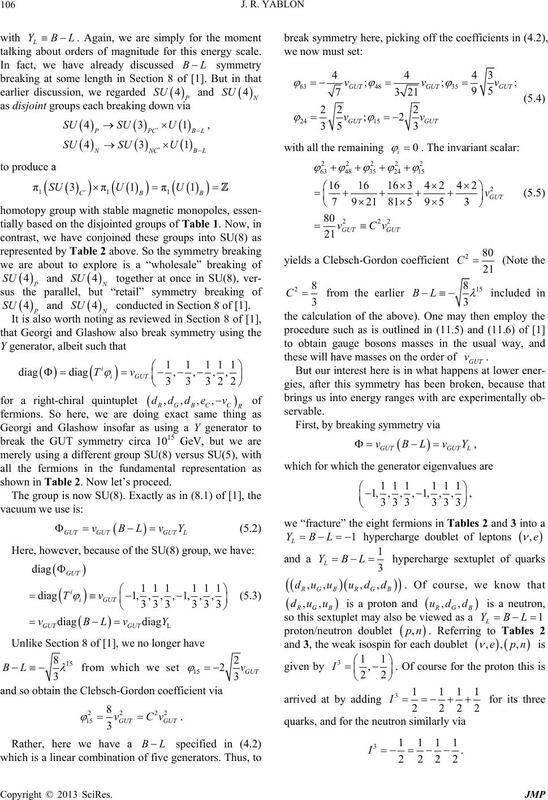 Fermions and generators of SU(4)N and SU(4)P.
right-chiral neutrino and split the representations. is simply too large and can or ought to be made smaller. SU(8) sufficient, and is everything in SU(8) necessary? Table 2. 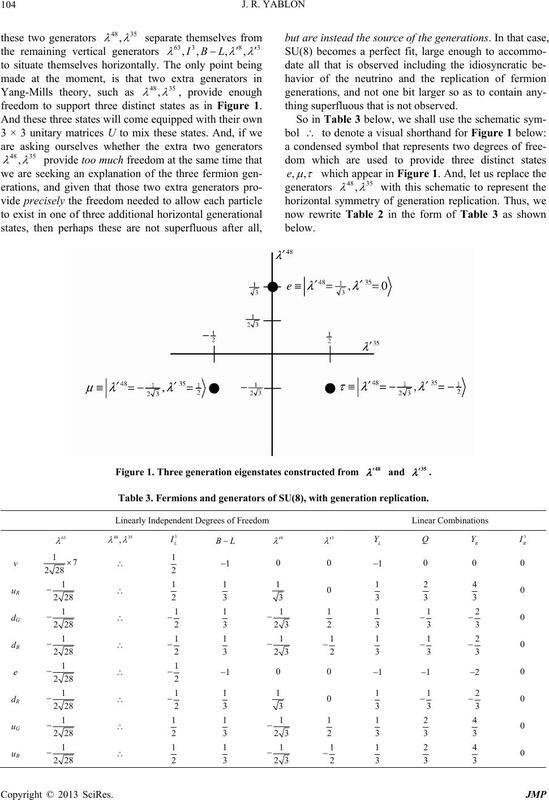 Fermions and generators of SU(8). that we have ordered the fundamental representation. we have left in their native state. 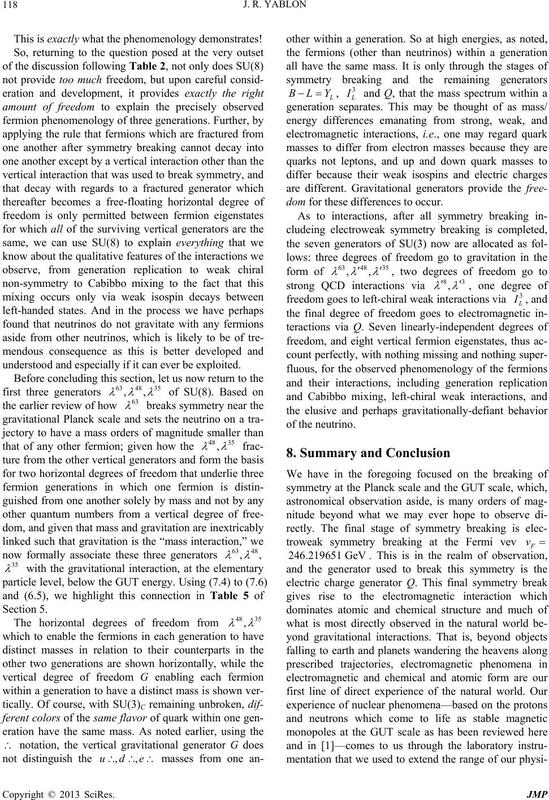 neutrino and in the replication of fermion generations. the quark masses arrived at in (10.3) and (10.4) of . where and how this appears. thus displaying its mass, than any other fermion. 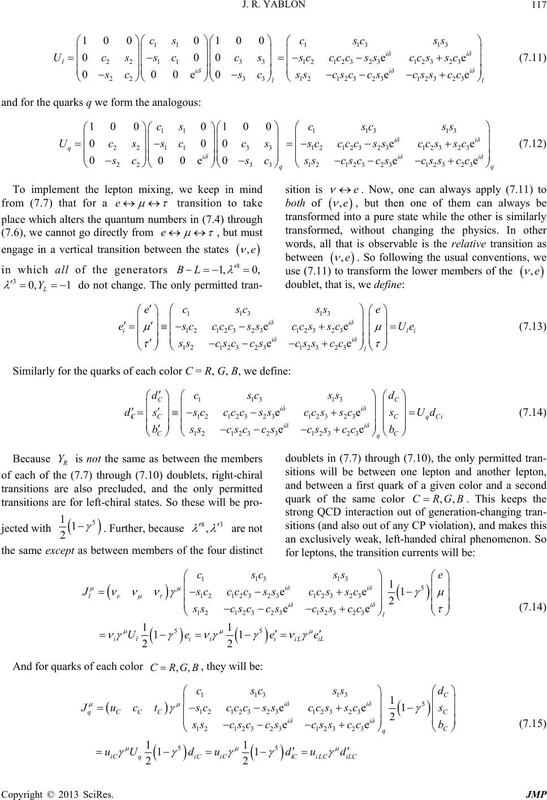 guished from one another by different quantum numbers. freedom to support three distinct states as in Figure 1.
thing superfluous that is not observed. Table 3. 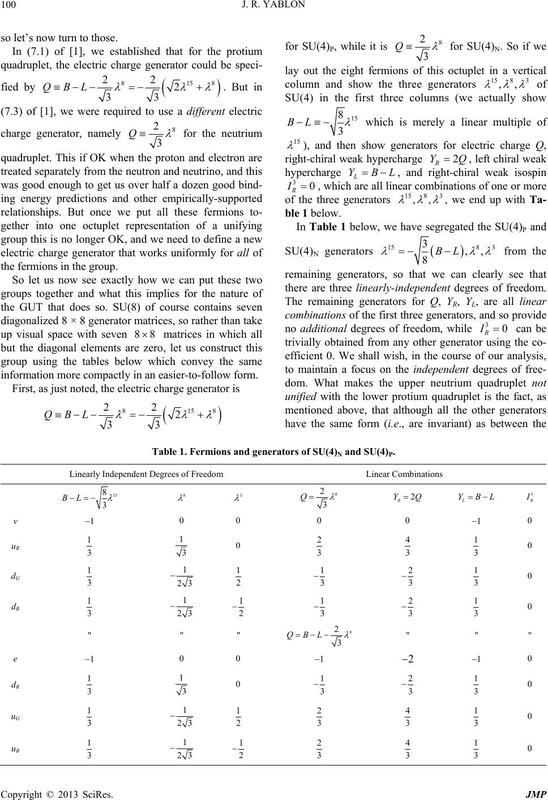 Fermions and generators of SU(8), with generation replication. in this way of representing SU(8). here as well, in the next section. 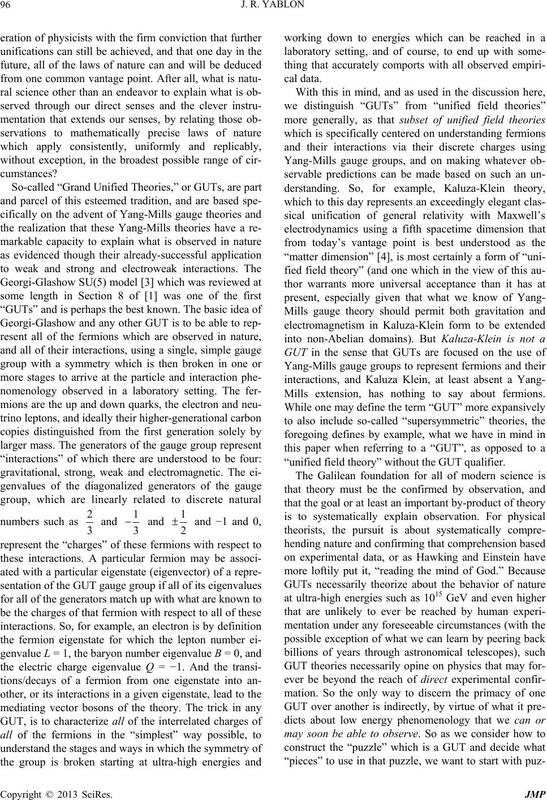 structure of the GUT gauge group right from the start. talking about orders of magnitude for this energy scale. SU conducted in Section 8 of . shown in Table 2. Now let’s proceed. are identical for each triplet. mion of a given type to take on one of three mass values. 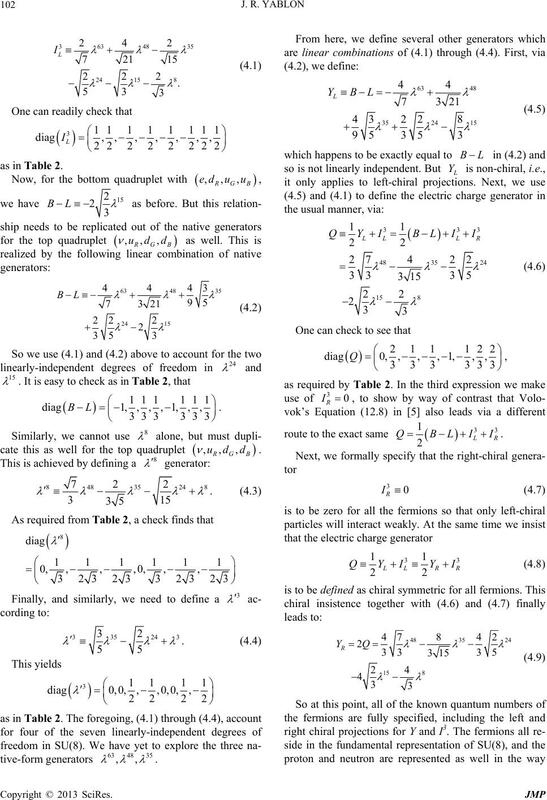 Thus we may formulate Table 4 below. Table 4. 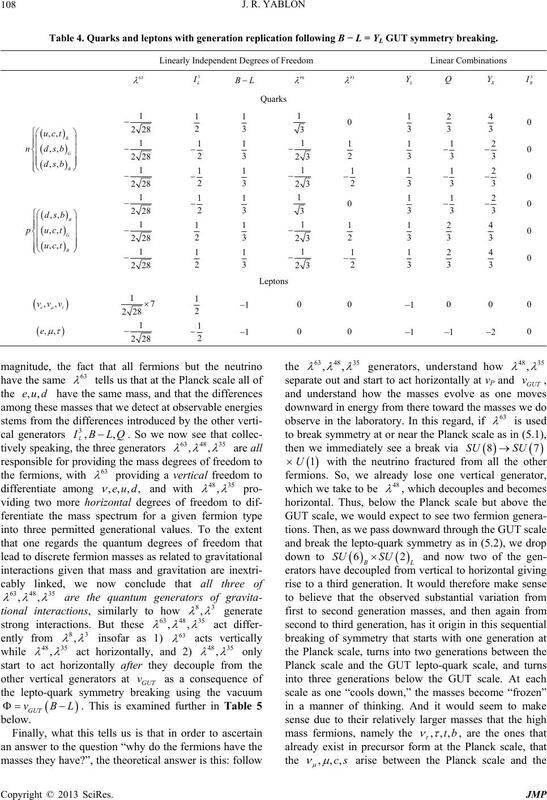 Quarks and leptons with generation replication following B − L = YL GUT symmetry breaking. Table 5. Mass degrees of freedom afforded by the gravitational interaction, below GUT energy. 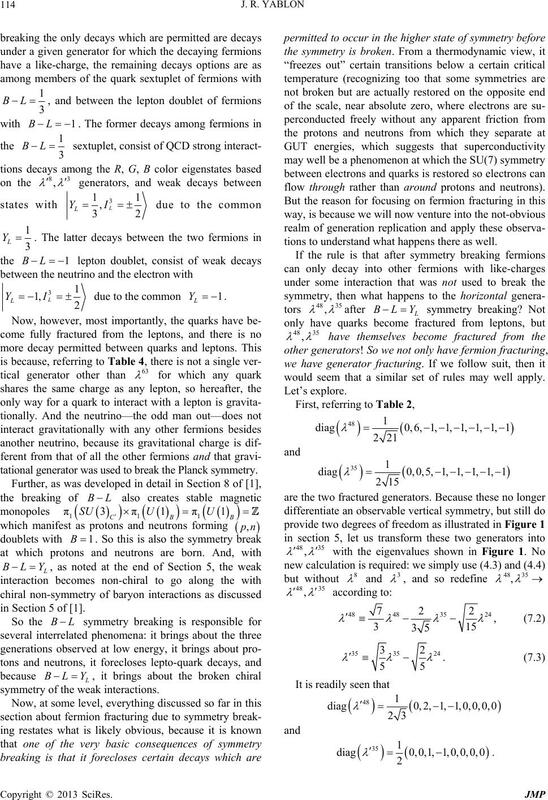 weak and weak hypercharge interactions. else we may be able to learn. 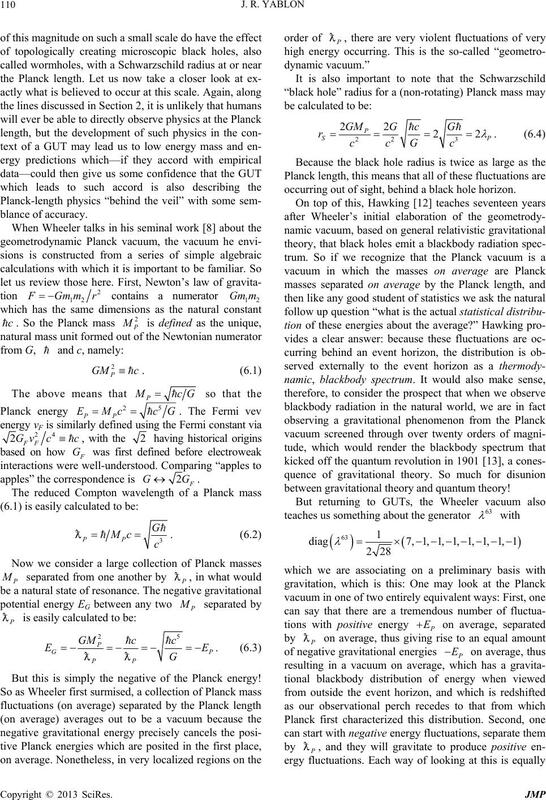 But this is simply the negative of the Planck energy! occurring out of sight, behind a black hole horizon. 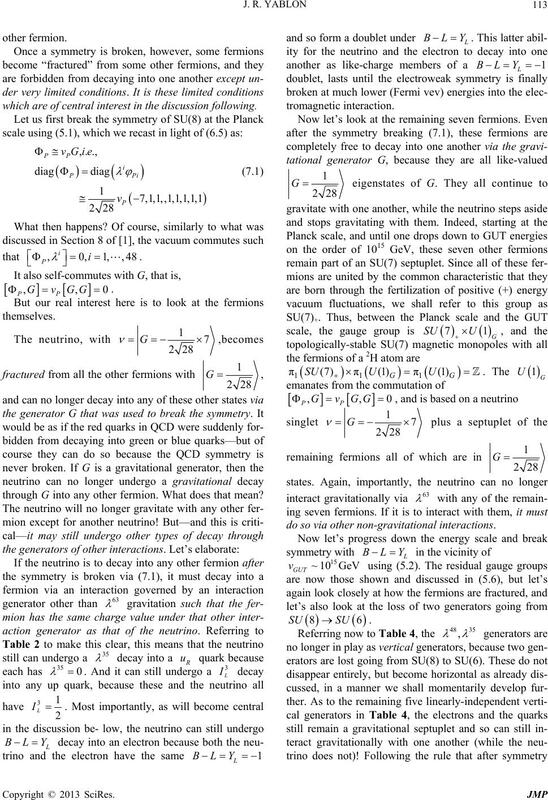 between gravitational theory and quantum theory! descriptions of exactly the same thing. of our SU(8) GUT group. 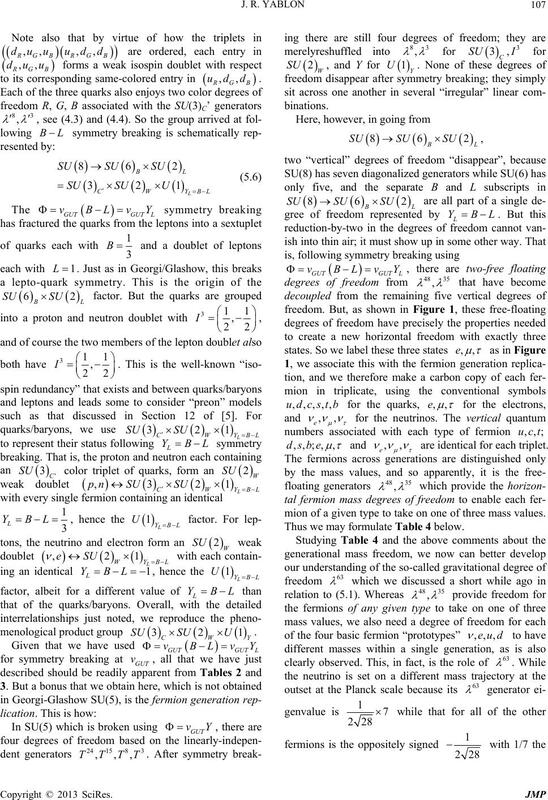 ized” by the Yang-Mills generators of internal symmetry. tions into observed particles, or the negative energy ones? observe in the material universe? would exist in equal numbers as part of an octuplet set. mions would be rooted in positive energy fluctuations. 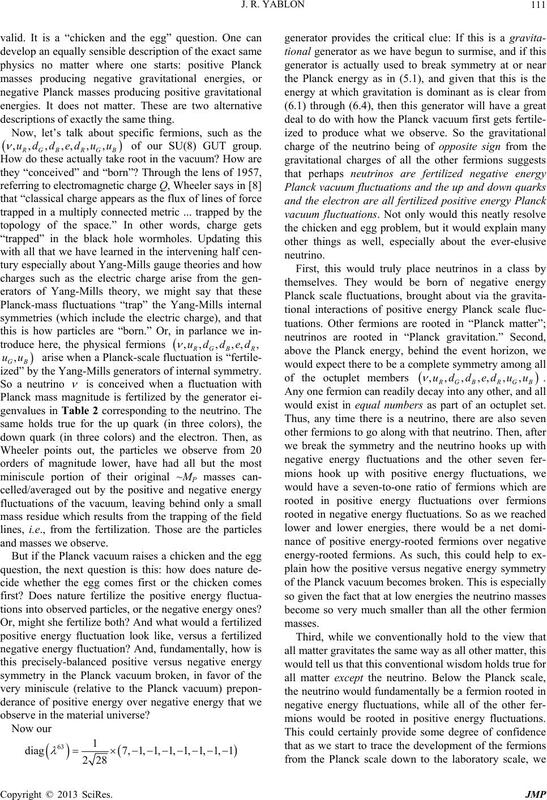 as what is observed for the neutrino. 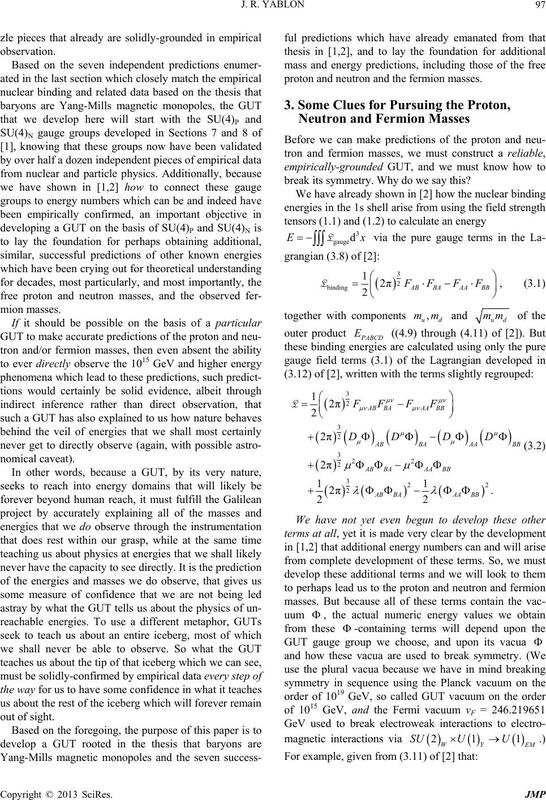 ognize that the neutrino defies this supposition. force are trapped in positive energy topological wormholes. which are of central interest in the discussion following. 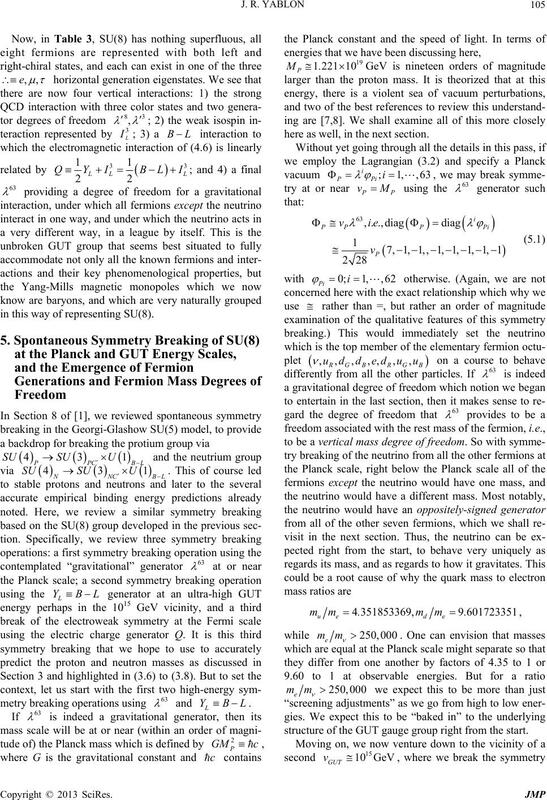 through G into any other fermion. What does that mean? do so via other non-gravitational interactions. 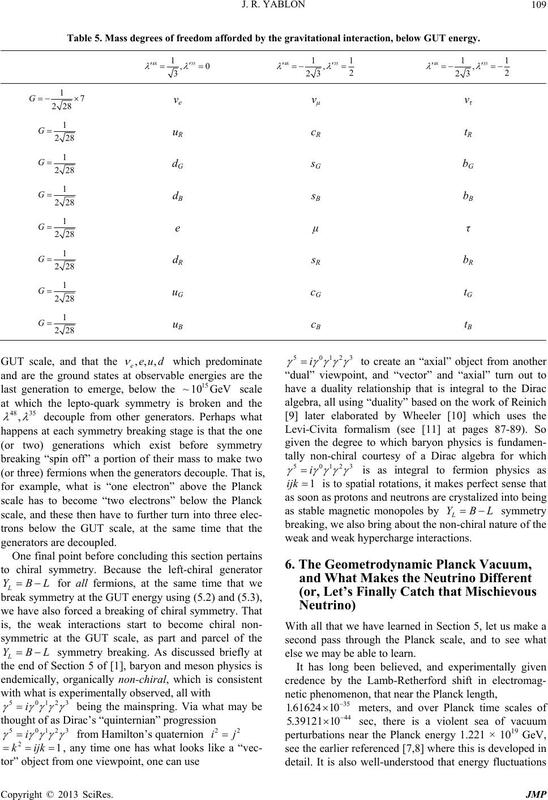 tational generator was used to break the Planck symmetry. in Section 5 of . symmetry of the weak interactions. flow through rather than a round protons and neutrons). tions to understand what happens there as well. would seem that a similar set of rules may well apply. mion with respect to that different generator. served, and this is because the generators are fractured. interactions, and the latter, of course, is not observed. as between the members of each of the above doublets.  states in (7.4) to (7.6). 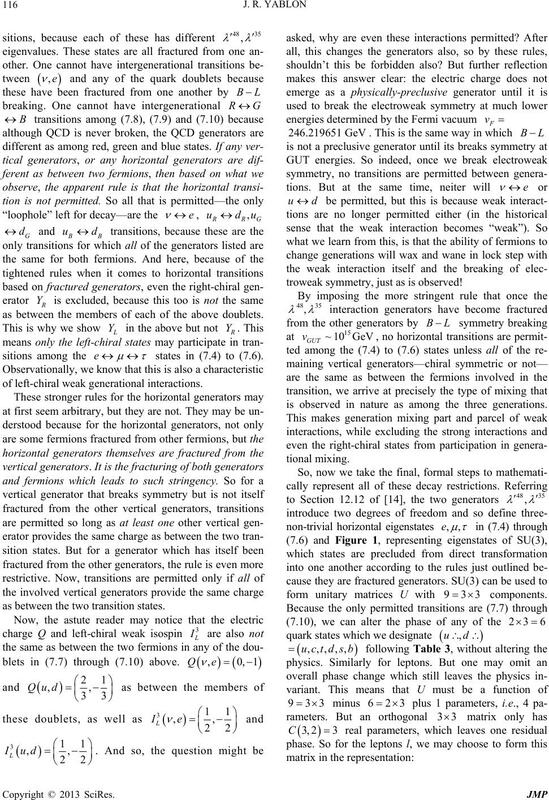 of left-chiral weak generational interactions. as between the two transition states. blets in (7.7) through (7.10) above. troweak symmetry, just as is observed! is observed in nature as among the three generations. form unitary matrices U with 933 components. This is exactly what the phenomenology demonstrates! understood and especially if it can ever be exploited. dom for these differences to occur. matter that populates and animates the universe. into any other different type of fermion. is eluded by the neutrino. tain sensible numerical matches to observed energy data. pirical data as well as they did in [1,2]. 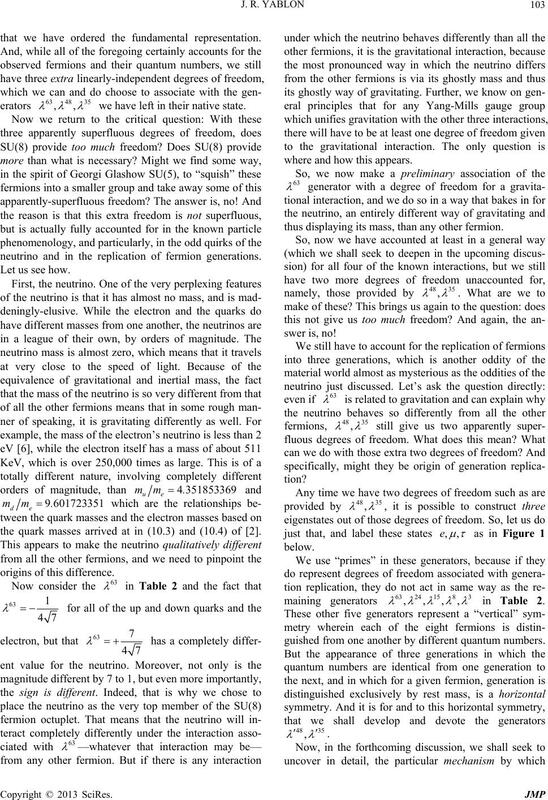 tion,” Freeman, New York, 1973, p. 1190.
namics,” Annals of Physics, Vol. 2, 1957, pp. 604-614.
ciety, Vol. 27, No. 1, 1925, pp. 106-136.
tion,” W. H. Freeman & Co., New York, 1973. 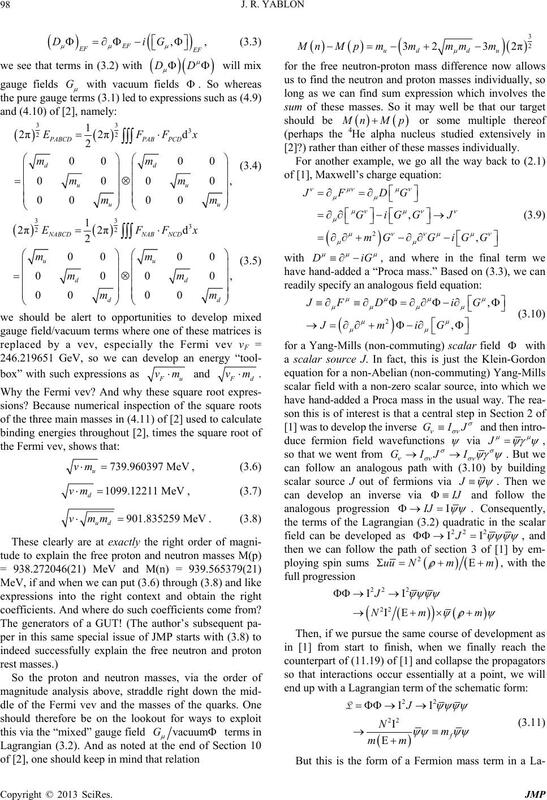 S. W. Hawking, “Black Hole Explosions?” Nature, Vol. Normal Spectrum,” Annalen der Physik, Vol. 4, 1901, p.